The 2017 Ford Fiesta is a subcompact car that's offered in two body styles: a sedan and a four-door hatchback. Both are available in S, SE and Titanium trim levels. The high-performance ST model is available only as a hatchback. The 2017 Ford Fiesta returns largely unchanged, save for the elimination of a handful of previously available option packages. The Fiesta, which comes in sedan and four-door hatchback versions, offers lively handling and performance that make even everyday errands seem fun. The performance-oriented Fiesta ST model is even more entertaining thanks to its sport-tuned suspension and 197-horsepower four-cylinder engine. But even if it's frugality you're after, Ford still has you covered with the Fiesta's 1.0-liter EcoBoost three-cylinder engine that delivers surprisingly zippy performance and outstanding fuel economy. What's more, all Fiestas are pleasant places to spend time, with comfortable front seating and a lot of the latest technology, including keyless entry and ignition and Ford's Sync 3 infotainment system, which features a 6.5-inch touchscreen that incorporates familiar smartphone gestures such as swipe and pinch-to-zoom. There are a couple potential deal breakers, however. Both the ST model and the 1.0-liter EcoBoost three-cylinder are offered with manual transmissions only, so you're out of luck if you don't want to shift for yourself. You can get an automatic on the mainstream Fiestas, but it's not the smoothest-shifting unit in the world. Finally, the car's pint-size dimensions mean there's a shortage of rear seat room and cargo capacity. If you're looking to explore other options, we recommend starting with the roomy Honda Fit, which can't be beat for cargo-carrying versatility. The Chevrolet Sonic is also a contender thanks to its confident handling, and checking out the related Hyundai Accent and Kia Rio is a wise idea. Ultimately, though, the 2017 Ford Fiesta sedan and hatchback remain among the best small-and-spunky choices out there. The entry-level S model comes with a decent list of standard features, including 15-inch steel wheels, variable intermittent wipers, power mirrors, a rear spoiler (hatchback only), remote keyless entry, air-conditioning, cloth upholstery, a height-adjustable driver seat, 60/40-split folding rear seats, a tilt-and-telescoping steering wheel, power locks and manual windows, Bluetooth, Sync voice controls, a 3.5-inch center display, and a six-speaker sound system with a CD player, a USB port and an auxiliary audio input jack. The Fiesta SE builds on the above with 15-inch alloy wheels, automatic headlights, upgraded cloth upholstery, a front center console with armrest, a leather-wrapped steering wheel, power windows, cruise control, a trip computer, chrome interior door handles, metallic-painted interior trim, multicolor ambient lighting and MyKey parental controls for teen drivers. The SE Appearance option package adds 16-inch alloy wheels, foglights, a rear spoiler (sedan), sport cloth upholstery, adjustable lumbar support for the driver, a leather-wrapped shift knob, the Sync 3 infotainment interface with a 6.5-inch touchscreen and enhanced voice controls (including AppLink mobile app integration), satellite radio and dual USB ports (replacing the auxiliary audio input jack). The Cold Weather package bundles heated outside mirrors, heated front seats and automatic climate control. 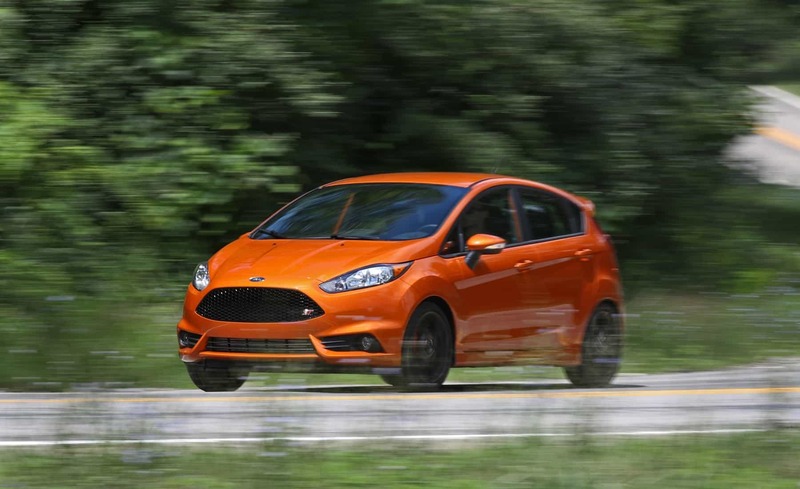 The SE can also be had with the SE EcoBoost Fuel Economy package, which includes the turbocharged three-cylinder engine, a manual transmission, various aerodynamic improvements, and special wheels and tires to help the Fiesta achieve slightly better fuel economy. At the top of the heap is the Titanium trim level, which incorporates the contents of the SE Appearance and Comfort packages but wears a different set of 16-inch alloy wheels, plus chrome exterior trim, a black grille and rear parking sensors. It also has keyless entry and ignition, automatic climate control, leather upholstery, a rearview camera, an auto-dimming rearview mirror and an eight-speaker Sony sound system with HD radio. The Fiesta ST hatchback also starts with the Fiesta SE's amenities plus the items in the SE Appearance package, then adds the turbocharged four-cylinder engine and the six-speed manual transmission, 17-inch wheels with summer performance tires, a sport-tuned suspension, upgraded brakes and quicker steering, unique bodywork, a larger rear spoiler and dual exhaust tips. You also get keyless entry and ignition, ST-specific cloth sport seats (with driver height adjustment), distinctive interior trim and the Sony sound system with HD radio. The ST Recaro package adds heated Recaro front sport seats (including height adjustments), leather and cloth upholstery, and heated mirrors. Also available are black 17-inch wheels with red brake calipers. A sunroof and a navigation system are stand-alone options on the SE, Titanium and ST trims. The 2017 Ford Fiesta gets a standard 1.6-liter four-cylinder engine that puts out 120 horsepower and 112 pound-feet of torque. A five-speed manual transmission and front-wheel drive are standard, and a six-speed PowerShift automatic transmission is available as an option. The PowerShift is technically a dual-clutch automated transmission that Ford uses for increased efficiency, but it operates more or less like a conventional automatic. In performance testing, both the manual and automatic-equipped Fiestas went from zero to 60 mph in about 9.5 seconds, which is adequate performance for this class. EPA fuel economy estimates for this powertrain are 30 mpg combined (27 city/36 highway) with the automatic transmission. The manual transmission is effectively the same, checking in at 30 mpg combined (27 city/35 highway). The optional EcoBoost 1.0-liter turbocharged three-cylinder produces 123 hp and 125 lb-ft of torque. The five-speed manual is the only transmission available. In performance testing, this little engine brought the Fiesta from zero to 60 mph in 8.9 seconds, which is a bit quicker than average for the class. EPA fuel economy estimates are 35 mpg combined (31 city/41 highway), matching the thriftiest cars in the segment. The Fiesta ST's turbocharged 1.6-liter four-cylinder is rated at an impressive 197 hp and 202 lb-ft of torque. A six-speed manual is the only transmission offered. In performance testing, the Fiesta ST sprinted to 60 mph in a sprightly 7.1 seconds. EPA fuel economy estimates for the ST stand at 29 mpg combined (26 city/32 highway), an excellent result for such a powerful engine.